One of the major role of penetration testing is recon-asset.The more you gather information,the more you win. It is possible for a organization to have one or many domains/sub-domains hosted under a certain iprange. To find out them It purely depends on hosting way they are using. Many organization use services such as cloudflare,Amazon etc as there hosting-providers where scanning ipranges for them is pain,Also there are lot of organization’s which are self-hosted. I wrote a short script to gather all possible domains/subdomain under the ipranges by following steps. 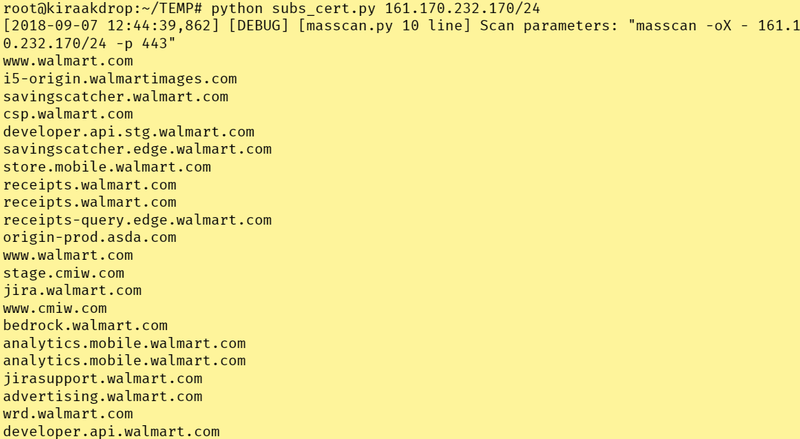 IPRANGE => Takes one by one ip from range => Resolve ip’s by checking if port 443 is up using masscan python module=> Check’s SSL Certificate of ip’s to look for CNAME => Scrape Domain/Subdomain from certificate.